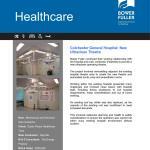 Bower Fuller continued their working relationship with the hospital and main contractor (Haymills) to provide a new ultraclean operating theatre. The project involved remodelling adjacent the existing hospital theatre area to create the new theatre and associated scrub, prep and anaesthetic rooms. Working within the existing hospital presented many challenges and involved close liaison with hospital staff, including timing shutdowns to suit hospital requirements, noise considerations and out of hours working. An existing roof top chiller was also replaced, as the capacity of the existing unit was insufficient to meet increased demands. This involved extensive planning and health & safety considerations to ensure the operation was carried out within busy working hospital environment without incident.